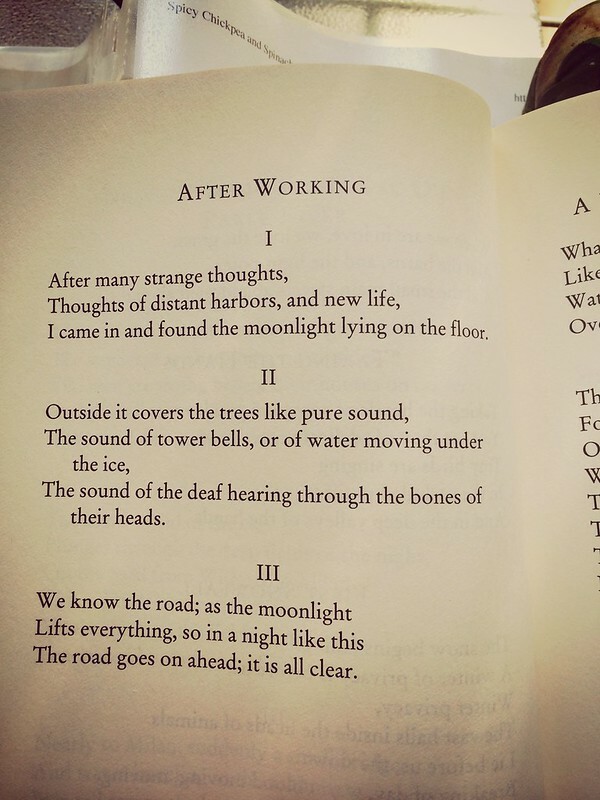 A terrific poem by Robert Bly: thank you. I am able to run 20 miles with no food (no pre-run meal and no mid-run Gu, etc.) in me other than a few calories from Nuun-fortified water…as long as I run slowly enough. Which won’t be happening on race day, but it’s been an interesting experiment in trying to train my body to burn something other than glycogen (AKA fat). Truthfully, skipping my pre-run bowl of oatmeal was more of a mental test, anyway. It’s like my teddy bear for long runs. I need more sleep than my standard 6.5 to 7 hours, if I’m logging 35+ mile weeks. And, I can’t just chop off the last 1.5 hours or my evening; I still need to do my rituals, but skip whatever fun I’d normally do before those rituals. Trying to balance the various elements of training for the race, as well as trying to balance life around it has helped me make a few decisions … faster. Priorities seem to come into clearer relief. Running with a GPS watch – this is the first running season I’ve done so – has been helpful in a variety of ways. I rely most on the heart-rate reading it gives me, to help me determine my training pace on most runs. It’s also been nice to have a mileage counter, though I still spend a little time pre-mapping out some runs, to help hit mileage goals. However! I ran two races last week, a back-to-back 10k and 5k, and the GPS component to the watch wasn’t working. And it was ok, if not better, to just go by feel and use the watch as a stopwatch. I did not PR in the races, but I did run consistently faster than I’d predicted I would. I put away (ate) a 3-cup volume of cut-up raw veggies, on Saturday. I have found a way to elevate my feet while watching TV after a long run: put ’em up on the rocking chair! Man, I go through a lot of laundry. Way more than I did when I went through yoga teacher training, four years ago. 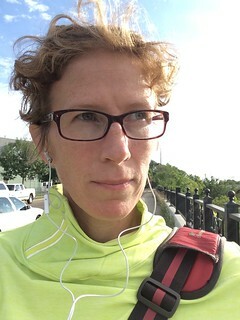 A week with 4 runs, 1 strength workout, 1-2 rock climbing evenings, teaching 2 yoga classes, and at least one round-trip walk or bike commute… this does not equal a week of 5 superheated yoga classes. I haven’t yet suffered – though there’s still time – through blackened marathoner toenails, though I had a close call a few weeks ago on a 20-mile trail run. However, every single run leaves a few bites on my torso, usually from abrasive parts of my running bra. So … I’m not unscathed. Good god, my orthotics SMELL. I’m re-thinking the decision to go with full-length style ones, versus the 3/4 length ones I’ve had in the past. Yes, it’s nice that they don’t slip around in the shoe a little, but I don’t think there’s a way to get the stink out of the insole glued to these $700 wonders. Grrr. So good, I liked it with _two_ accounts!